Since these locations aren’t well marked, I’ve measured their distance from Rio Road, the southernmost stoplight in Carmel. Please note that Big Sur cell reception is spotty at best. The Sobranes Canyon Trail leads hikers through an impressive succession of habitats in a relatively short distance. Departing inland from Highway 1, the canyon trail traverses a creek half a dozen times through sections of wildflowers, prickly pear cacti and a redwood grove. The narrow trail encounters plenty of rabbits, lizards and snakes so keep a close eye on what’s sharing your path. The first 1.5 miles ascend gradually before connecting with the steep Rocky Ridge Trail, which becomes very steep. From the Sobranes Canyon Trail, the yellow lupine studded Rocky Ridge trail climbs to a point at 1,600 feet with stunning nearly panoramic vistas including a sweeping ocean view.The The trail then descends just as steeply ending at the highway near the Canyon trailhead. Allow at least 3.5 hours and bring at least a liter of water per person as there is little protection from the sun. Dogs are not permitted. Just a quarter mile beyond the Sobranes Canyon trailhead on the ocean side of highway one are two small pullouts with access to the Sobranes Point Headland trail. Although rather inconspicuous from the road, this easy trail leads visitors to fascinating views of the interplay of land and sea. The headland is shaped almost like a palm with many rocky fingers jutting out into the surf. 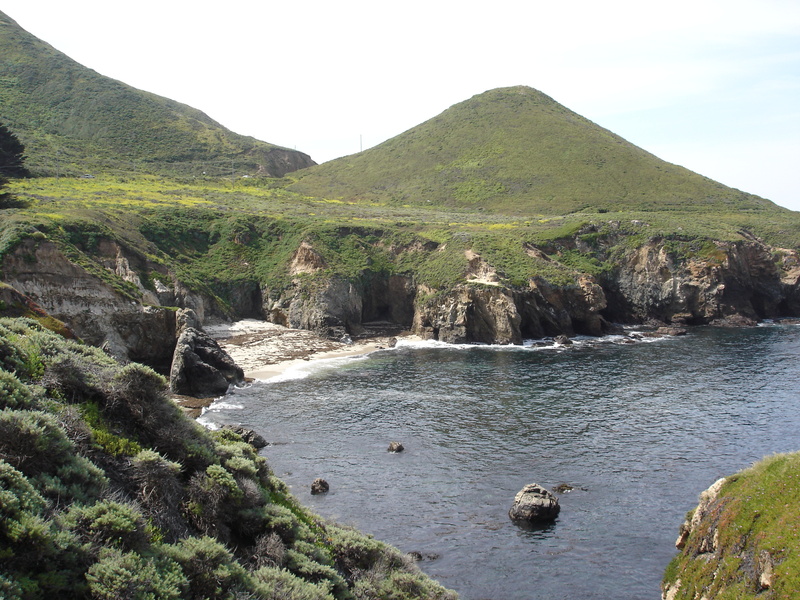 For much of the trail you are hidden from view by the conical headland peak. The loop rounds the peak and returns to both pullouts at the highway. Between those pullouts is an out-and-back trail that ascends the conical headland peak, which although not very high or challenging to ascend offers rewarding views. Near the top is a bench inscribed with an inspiring message where one can savor the view. An unmarked pullout on the right side of highway 1 begins the short trail that meanders down the hill to the spectacular Garrapata beach. The scalloped bluffs make for shaded nooks from which to observe the turquise waves rolling up past scattered offshore rocks. The south side of this beach has geologically interesting rock formations, but most will enjoy the beauty and solitude found here. Certain times of year this beach offers good but challenging surf. Other times the powerful shore break is mystifying. Dogs are welcome. 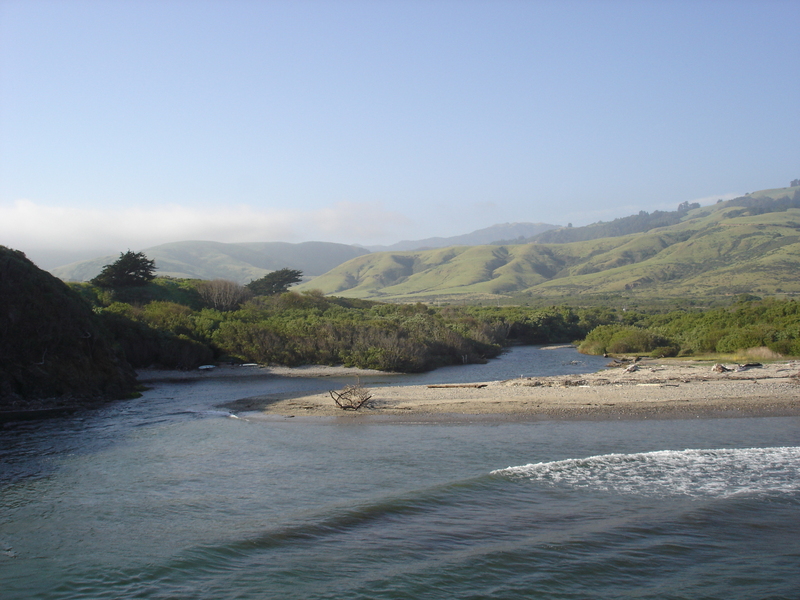 While Andrew Molera is a huge State Park with many miles of challenging trails and a white triangular peak, it is best known for its level riverside trail that meanders to a stunning river mouth beach. Near the parking lot, a seasonal foot bridge crosses the river immediately so that one could keep dry through the grassland the whole way to the beach. A more rewarding route is to the right of the parking lot. This trail leads along the campground with additional restrooms, past the historic Cooper cabin (oldest structure in Big Sur built 1860), and repeatedly checks the Big Sur River. Near the end one can cross the knee deep river to access a long, secluded beach. Another option from that trail is to take a staircase on the right before the river crossing to a bluff above the river mouth. From here visitors have a stunning view of the zigzag ocean-bound river, the slowly curving beach nestled against golden cliffs with a white mountain peak in the distance. Dogs are not permitted on the beach or trails. 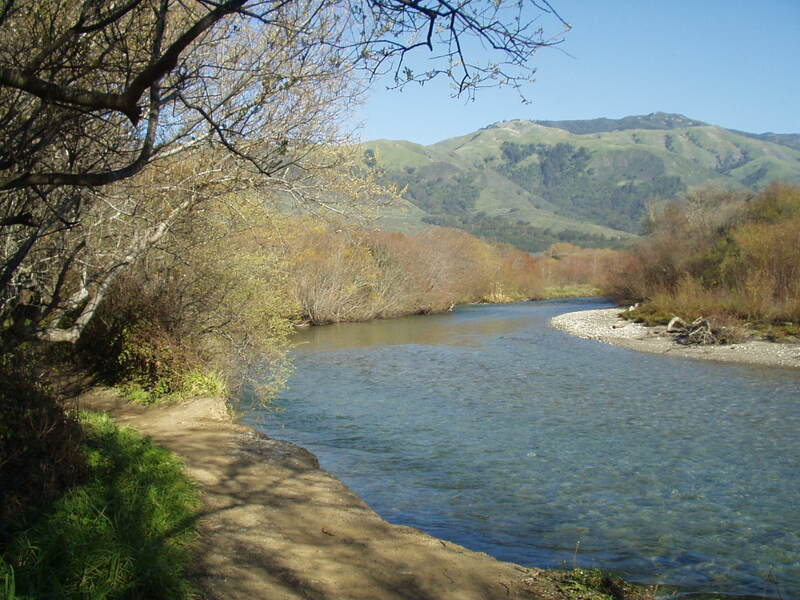 A half mile hike criss crossing the brisk, waist-deep Big Sur River leads through picturesque fern studded cascades to a gorgeous yet chilly swimming hole with plenty of tall rocks to jump from. $8 entrance fee, campsites & lodge available. This day use beach is famous for the giant towering boulders just offshore pieced with wave formed tunnels. The whitewater and sunlight crash through the tunnels making for a dramatically beautiful scene in the right light. A long trail ascends beyond the north end of the beach for solitude and sweeping views. To get there look carefully for Sycamore Canyon Road one mile south of Pfeiffer Big Sur State Park, South of Big Sur Station. If you reach the post office you’ve gone too far. $5 entrance fee.